The launch of sub-orbital space travel presents the opportunity to radically shift global property markets, according to Knight Frank’s Wealth Report. The Wealth Report 2014 – which is launched on Wednesday March 5 - highlights the rising trend for private wealth investment in space research — from asteroid mining to sub-orbital space travel. Knight Frank has identified more than 70 wealthy individuals, with a combined wealth of over US$200 billion, who are targeting this growth sector. The investment promises to transform terrestrial property markets. “By travelling outside the Earth’s atmosphere, gravitational forces will allow spacecraft to travel at over 4,000 miles per hour, so breakfast in Mayfair could easily be followed by lunch overlooking Sydney Opera House,” explains Knight Frank’s Head of Research Liam Bailey. As the Wealth Report’s Global Cities Survey confirms, London currently wins over New York as a global wealth hub, in part because it is more convenient for African, Middle Eastern, Russian and European UHNWIs. But within a decade, this convenience premium could be noticeably reduced if Richard Branson’s Virgin Galactic succeeds in making his vision for sub-orbital travel a reality. Ticket price will be critical. If this is a technology for billionaires only, then property market disruption might be limited to a wider choice of global lunch options. But if the price drops to allow the merely very wealthy to access sub-orbital flights, then every assumption about current property prices will have to be reconsidered. Liam Bailey states: “Take second homes in Europe. Right now, demand is mainly restricted toEuropean investors, who try to limit their travel to less than two hours. In future, that same time limit could allow Chinese or Indian investors to pop over for the weekend to visit their Tuscan farmhouse. “New York may well gain ground from London, but that is in relative terms. As all the global hubs become dramatically more accessible, the criteria for choosing a second home become more about the location itself, and much less about the convenience of travel. But it’s not just the travel industry that is going galactic. Behind the telegenic images of Virgin Galactic’s SpaceShipTwo is a burgeoning industry investigating the commercial possibilities of space. Mining asteroids for precious metals and rare minerals might be an activity confined to computer games for now, but two companies – Planetary Resources and Deep Space Industries – are taking the prospect very seriously. Even the public sector has been prompted to consider the potential, with NASA’s recent launch of its Robotic Asteroid Prospector project. While eyebrows have been raised in scientific circles regarding the economic viability of asteroid mining, the potential rewards appear compelling, if the significant technological challenges can be overcome. 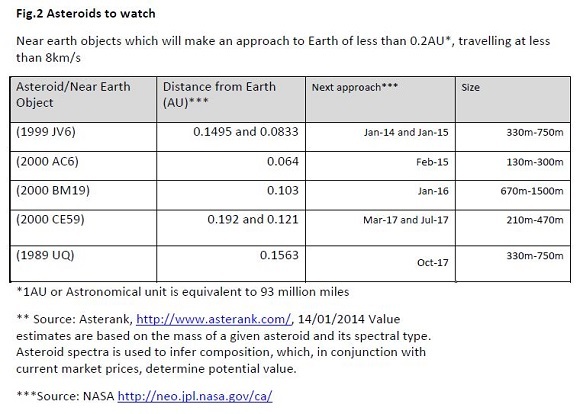 Knight Frank has published a list of our favourite “asteroids to watch” on our website, confirming the potential value of the key space rocks that will be coming (relatively) close to Earth soon. However, the more immediate impact of this new extra-terrestrial investment is likely to be felt rather closer to home. While Richard Branson is currently focused on his Virgin Galactic spaceship, which will make him and his children astronauts later this year, he is also thinking about other applications for his space investment.